Halloween is over and the excitement of Christmas is knocking at your door. The kids are, hmmm how should I say this, OUT OF CONTROL. Many times all you hear is what they want for Christmas. There is so much excitement and it is hard to contain it. I have often contemplated getting out our Elf on the Shelf very early just so I can help give my girls something to help keep their excitement in check. I have even thought about starting an Christmas advent calendar that early. However, I am BIG on not overlooking a great holiday. That holiday is Thanksgiving. The month of November is a PERFECT time to set up our attitude for the coming holiday. However, it is hard to do when Christmas is so huge and Thanksgiving is often overlooked. There are so many things to help keep the spirit of Christmas in our homes, but nothing really for Thanksgiving. I have always done a gratitude board, tree, or banner for the month of November. However, this year I wanted to start something fun. I wanted to do something that was geared towards kids. Something that could be a game (sort of), but still helping my girls have a thankful attitude. I love the idea of the Elf on the Shelf. I love the general principle of it. I am not a huge person to have our elf do crazy things. I do not go overboard, but I do think it brings the magic of Christmas into our home in a small and simple way. So I decided to come up with a Thanksgiving friend for the month of November. Introducing... Thankful Turkey. I love him and I think he's kind of cute. I want to share this idea with you in case you are struggling like me then you have something you can do during the month of November. It is really simple and it is something fun to do each morning in November. I have provided all the printables you will need. So really you just need to get a turkey, print off the printables, and then follow the daily directions. They should not be too hard to do each day. Make it simple. I do not like things that are difficult or cause stress. This should not be one of those things! This is such a cute tradition!!! I always make sure that we learn about Thanksgiving and don't overlook it for Christmas! 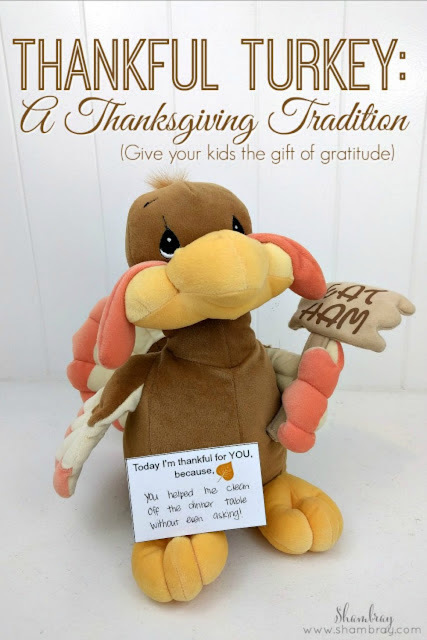 :) It's hard because we travel back to Chicago every year so I bring portable "thankful" lessons...this turkey is a GREAT idea for that! Yes. I think it would be a great thing for Thankful Lessons! It helps when it is fun too! Hope You like this Collection of Thanksgiving Day.